Mohamet fled by foot from Syria to Germany, he has currently no contact to his parents who are in Turkey and he is threatened to be brought back to Bulgaria where he has primarily arrived in the European Union. Mohamet has a kind character and makes an open minded appearance as we visited him at his working place Klingenberg Zäune, a small company with 24 employees near to Hannover. The 20 year old young man becomes a metalworker there. It’s not his first working experience: After finishing school in Aleppo he had a job in Turkey and in Germany. He already made an internship at the vehicle manufacturer VW (Volkswagen Nutzfahrzeuge), too. As a participant of the education program SRINT Dual Mohamet is learning German as well as preparing himself for his future job career in Germany. He is supported by his coach Gerhard Wagner who is also helping him to get a residence permit in Germany so that Mohamet can stay in Germany. Furthermore, Mr. Wagner managed the meeting at the administrative tribunal which is necessary for migrants and he went to the employment agency for getting help during the vocational training of Mohamet. It was a huge help for him and proofs that SPRINT Dual is such a meaningful accompaniment for young migrants. 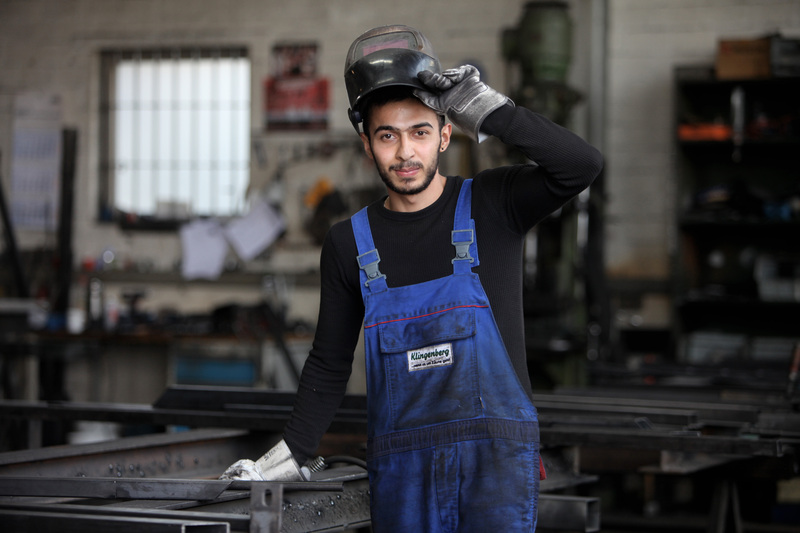 After starting the German language course, Mohamet has taken huge steps in learning German and soon, all employees of Klingenberg took him into their hearts. For the company the participation in the program SPRINT Dual is a great asset. Nevertheless at the beginning they were skeptical, Mohamet’s Boss Lutz Klingenberg told us. “We didn’t know if his knowledge in mathematics and technical language is sufficient enough and we weren’t sure if we can manage the bureaucratic effort. But in the end it was worth it and we’ve got a lot of support thanks to the BNW. Now they hope that Mohamet can stay in Germany and finish his vocational training at Klingenberg Zäune successfully instead of be sent back to Bulgaria by the authorities. Mohamet keeps being optimistic: “I feel safe and in good hands”, he says. We cross our fingers and wish him all the best and good luck on his way!